Good job to everyone! We’ve submitted over 400 hats! The December incentive pattern is Zoe. Post your finished hats in this thread to get your incentive. There is another way to participate. You can now donate for your favorite team. Click here and choose your team. $5 is equal to one hat for your team! Each $5 lets Halos of Hope to ship 16 hats to cancer centers and hospitals around the country. We are starting to gather grand prizes for the winning team. Hatnado was amazingly fun. There was cake and wine and mockery of the fantastic opus Sharknado. Thank you so much to Alamitos Bay Yarn Company for letting us use their space and to everyone who came out and donated hats. Laura has been having a lot of family time, including visits from her sister-in-law (who is MIllieHanS on Ravelry. She is tired from getting the house ready. She is doing a lot of Stitches West prep. She may take Tournament 10 off from Nerd Wars. She is possibly seeking a new captain or co-captain for Team Browncoat. We mention Ysolda’s Mystery knitalong. Jen has been baking fancy pies for various holiday events. She’s been trying to get into the Christmas spirit, because she’s been working a lot. Jen got her tree up though. Santa will bringing Laura’s Christmas tree (which is what her step-granddaughter are used to). Jen has the whole week off and is looking forward to it, because knitting time! And the Doctor Who Christmas special. Jen has also entered the 30 Day Sweater Design Competition, so thank you to everyone who voted for her. Laura is working on a third Big Damn Hero Hat by Dryope out of Knitpicks Brava in Rust, Yellow, and Orange. She’s also working on an r Odessa Hat (without beads) by Grumperina out of Dizzy Blonde Studios Superwash DK in the color Jessica (turquoise) for her sister-in-law. She’s also working on a Spring Lacy Hat by My Hobby is Crochet out of Berroco Comfort in Copen Blue and Lemon for a woman at work who is getting chemo. Jennifer is knitting the California Poppy Shawl by Lydia Tsymbal out of Baah La Jolla in My Sweet Valentine for Melissa. She’s also knitting a Man Hat by Haven Leavitt out of blue Plymouth Encore Yarn for Halos of Hope. And she is working on her Kently Socks by Heather Ordover out of Koigu. 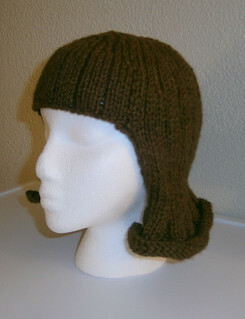 Laura finished a Flick Wig by Wild Daffodil in Berroco Vintage Chunky Yarn in chocolate for a friend’s mom. (We point you to Episode 1 for the story of this yarn, which was Laura’s first Frog Pond story for the show and involves a Sylvi Coat and the Yggdrasil Afghan.) She made an Olivia’s Butterfly Hat out of Berroco Comfort in Copen Blue. 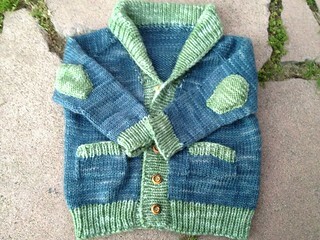 Jen finished her Easy Baby Sweater by Susan Mills out of Classic Elite Liberty Wool in Caribbean Tide for her nephew. She also finished gramps by tincanknits out of Delcious Yarns Frosting Worsted in Blueberry and Pistachio, again for her nephew. She finished a vanilla hat in Blue and White Encore for the Throwdown. And she finished her secret Christmas project. Laura has put her Sous Chef hat by Marly Bird out of Knitpicks Brava in Rouge and Coral. It’s just too labor intensive right now. Her sock design in Lambie Toes is also on hold. We talk about Wollmeise and self-striping sock yarn. Jen is sad because her devils tower is too big. All of her Halos hats need ends woven in, she has shawls and cardigans and everything. Laura had to tink back three rows on the Grumperina hat, because she was talking too much while knitting. Jen had to frog her entire California Poppy Shawl because she made a big mistake and she was only 24 rows in. She decided it wasn’t worth it to drop down and fix it, because that would have taken just as long as frogging and re-knitting. She also accidentally stabbed herself in the chin with a darning needle. Be careful with those things. Laura wants to make a Dragon Tail Hat by Jen Spears for Nerd Wars, Doctor Who-inspired hat out of Dizzy Blonde Superwash DK in Smurfinator, and Down the Garden Path by Michele DuNaier out of Lambie Toes for her Stitches West booth. Jen will be working on more hats (maybe even a crochet hat), her cardigan design (she’s excited to use her Wollmeise), and she really wants to do some colorwork so she might make Water for the Elephants by Rose Hiver or mitts inspired by Jacaranda blossoms (her own designs). We announce the 2014 Stashdown. We like themes for the year more than resolutions (we are cribbing shameless from the Knitmore Girls). We both have obscene stashes, so for 2014 we have set some goals to reduce stash. Jen’s 2014 theme is to simplify her life and create things to make her life overwhelming, which involves letting go of a lot of stuff. She wants to get rid of her stash by knitting. We challenge ourselves and our listeners to reduce stash as a year-long project. Knit from your stash all year long. Catalog your stash and find out what you have (however you want to). Then set goals for yourself. Each month will have a theme and a thread to post FOs along the theme and there will be prizes. Set some goals for yourself (these are personal, so whatever you want). Jen’s goals are to buy no yarn except for at Stitches West or if Wollmeise Lace becomes available and to knit at least 20000 yards of yarn (this may be reassessed). Laura will only buy yarn at Stitches (as much as she wants) and only one skein of yarn at smaller festivals. She wants to knit at least 1/3 of her stash. She will check her stash before she buys yarn for projects. There will be a confessional thread for when you fall down. No judgement, just acknowledgment to help you get back onto your goal. Go to the general Stashdown Thread on Ravelry to post your goals and chit chat about your stashdown ideals. We’ll open the January and confessional thread soon. We also recommend using a meter from Knitmeter.com to track how much you’ve knit, crochet, or spin over the year. We talk about Agents of S.H.I.E.L.D., which is at its midseason hiatus. We both want to love the series, but right now we only like it. We are hopeful for the future, knowing how Joss’s first seasons go. We point out the Star Trek Renegades trailer. We also point out io9’s article about 10 TV Shows that Desperately Need Their Own Drinking Game. We will be at Stitches West, which is February 20-23 in Santa Clara, CA at the Convention Center. Dizzy Blonde Studios & Skeindalous Yarns are sharing a booth (booth 906); we will update you with the booth number when we get it. Halos of Hope will have a booth (booth 908) and we may have a Meet and Greet. We will will be at the Friday Night Pajama Party, hosted by Marly Bird. It’s a lot of fun, we hope to see you there. The Dizzy Blonde booth is a collection point for Halos of Hope hats for Team KnottyGirls (the final collection point!). With prizes! Shout out to the Purlescence Girls! We will get together with the Yarn on Tap Girls for an event we call Knit2Together. This will be sometime in January at a point halfway between us and we will knit hats for Halos of Hope. P.S. What Does the Fox Say? Today’s episode is sponsored by Dizzy Blonde Studios. For holiday gifts for the knitter in your life, please visit DizzyBlondeStudios.etsy.com. Shop updates will occur throughout the month of December. Good job to everyone! We’ve submitted over 300 hats! Check out the Podcaster Throwdown group in Ravelry. Check out the Halos of Hope website and Ben’s interview with Pam Haschke on Fiber Hooligans. Jen has been sick but she’s getting better. She’s also been getting ready for the holidays. She was unable to bake for parties (because that’s not great when your sick). She’s also been working on pattern writing. She recommends Craftsy. Laura is recovering from the three (yes, three) Thanksgiving dinners. She’s working to plan Christmas holidays, juggling the schedules of all the families. She’s working on her Nerd Wars; there is a Smaug theme this round to celebrate The Hobbit. She’s decorating for Christmas. She’s also working on getting her house and studio together after the remodel. Jen has started a second Gerri Hat for the Throwdown out of the Peter Pan Wendy Yarn in pink. She has been working on her secret Christmas project. It’s blocking. Finally! She also is working on another vanilla hat in white Plymouth Encore Yarn. She ran out of yarn, so she’ll probably make the top blue. And she is working on gramps by tincanknits out of Delcious Yarns Frosting Worsted in Blueberry and Pistachio. Laura is working on her original sock pattern out of Lambie Toes in “No Touching Guns”. She’s also working on a third Big Damn Hero Hat by Dryope out of Knitpicks Brava. She’s also doing a Sous Chef out of Knitpicks Brava. Jen finished two vanilla hats out of white Plymouth Encore and a Gerri hat out of the pink Peter Pan yarn for the throwdown. 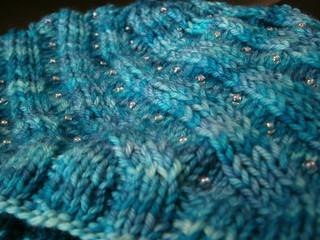 Laura finished her Sassy-tis (Clapotis by Kate Gilbert) out of custom-dyed Dizzy Blonde Studios yarn. She also finished her Gavin’s DinoRAWR Spiked Beanie Hat by Niki Wyre out of Knitpicks Brava and her Companion beaded choker in Hempathy. 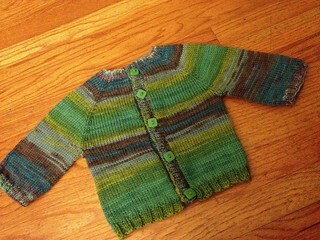 Jen finally finished the sleeve on her Easy Baby Sweater out of Classic Elite Liberty Wool in Caribbean Tide. Laura is ready to pick up her 22 Leaves Shawlette by Lankakomero. She’s making it out ofMean Girls Yarn Club in Heart in a Box. Laura finished her Companion and got credit for it in Nerd Wars and then promptly frogged it. She was unhappy with the center section and it was too small. She does not enjoy knitting with Hemp Yarn. Jen is going to knit the California Poppy Shawl out of Baah La Jolla in My Sweet Valentine for Melissa. And she is working on her Sweetheart of the Rodeo design and figuring out how she wants to chart her designs. 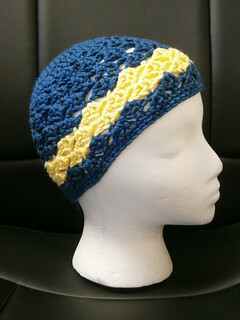 Laura will be making a Crocodile Stitch Slouchy Beret by Bonita Designs. She may be making a River Tam hat (pattern by Jessamyn Leib) in Dizzy Blonde Jessica (which is turquoise), but she is struggling with the tubular cast on. Jen recommends Eunny Jang’s tutorial. She’s going to make a Doctor Who inspired hat out of Smurfinator. And she will be making Down the Garden Path by Michele DuNaier out of Lambie Toes. She will use it as a crochet sample in her Stitches booth. We have an interview with the amazing Pam Haschke of Halos of Hope. She shares her story about how she started Halos of Hope. Here is the The Happy Hat story (and here is Drew’s blog about it as well). We also talk a bit about Southern California and about her crafting. Pam mentions Fiesta Yarns Starburst La Boheme. Laura tells a story about Trixie and yarn. A Halloween bag for Socktober! We announce the winners of the Socktober KAL/CAL. The People’s Choice winner is Photoknitgal’s Hitchhiker. Congratulations! 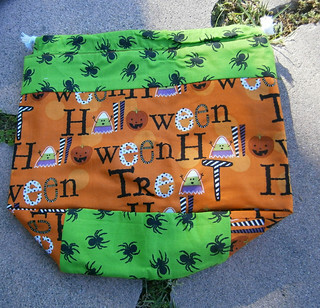 You win a Halloween-themed project bag sewn and donated by our amazing JoniLvsNeddy. Runner up is apple380’s Doctor Who socks. Congratulations! You win a HiyaHiya scutti bag. Random draw winner number 1 is moclell’s Line Break. Congratulations! You win some Hiya Hiya sock needles. And our second random draw winner is apple380’s Hitchhiker. Congratulations! You win some Kollage square sock needles. Jen points out two cool knitterly things: KnitsforLife made a knit apple pie crust and Bohemia Fibers is doing American Horror Story Coven Limited edition yarns. We talk about some perfect gifts for the geek in your life. Star Trek Transporter Bath Mat and Shower Curtain. We also recommend giving your partner the gift of uninterrupted geek time. Hatnado!!! Come watch (and mock) the masterpiece of a film known as Sharknado! and knit hats for Halos of Hope with us. It will be in the Annex of the Alamitos Bay Yarn Company on Saturday, December 14th from 1:30 to 4:30pm. Bring munchies and wine to share if you want to. We will bring cake! Seating is limited to 18, RSVP here. We will be at Stitches West, which is February 20-23 in Santa Clara, CA at the Convention Center. Dizzy Blonde Studios & Skeindalous Yarns are sharing a booth; we will update you with the booth number when we get it. Halos of Hope will have a booth and we may have a Meet and Greet. We will will be at the Thursday Night Market Preview. The Dizzy Blonde booth is a collection point for Halos of Hope hats for Team KnottyGirls (the final collection point!). With prizes!